Earnings are taking center stage and moving markets. 1. Tracking the tech giants: Apple (AAPL) shares are rising by about 7% premarket after the company reported its latest earnings, which revealed a sales slowdown. However, the results weren't as dire as expected. On the other end of the spectrum, Twitter (TWTR) stock is tumbling after its latest set of results disappointed investors. The company has been trying to attract new users by adding more video streaming and better news curation features. But its monthly active user base only grew by an underwhelming 3 million compared to the previous quarter. 2. More earnings: Earnings season continues with Coca-Cola (KO), Boeing (BA), Anthem (ANTX), Comcast (CCV), Fiat Chrysler (FCAM), T-Mobile (TMUS) and Hilton Hotels (HLT) reporting ahead of the U.S. open. Investors will also hear from dozens of companies this afternoon, including Facebook (FB), Marriott (MAR), Whole Foods (WFM) and GoPro (GPRO). In Europe, shares in Deutsche Bank (DB) are sliding by about 4% in Germany after the firm reported sharp falls in revenue and profits in the latest quarter. Shares in luxury conglomerate LVMH (LVMHF) are rising by about 8% as investors toasted its latest results, which showed strong growth in its wines, spirits, perfume and cosmetics businesses. 3. Watching for policy shifts: The U.S. Federal Reserve is slated to announce its decision on interest rates at 2 p.m. ET. The market is widely expecting that the Fed will hold interest rates steady. Meanwhile, on the other side of the world, local media are reporting that Japanese Prime Minister Shinzo Abe announced he's working on a new economic stimulus package worth more than 28 trillion yen ($265 billion). 4. 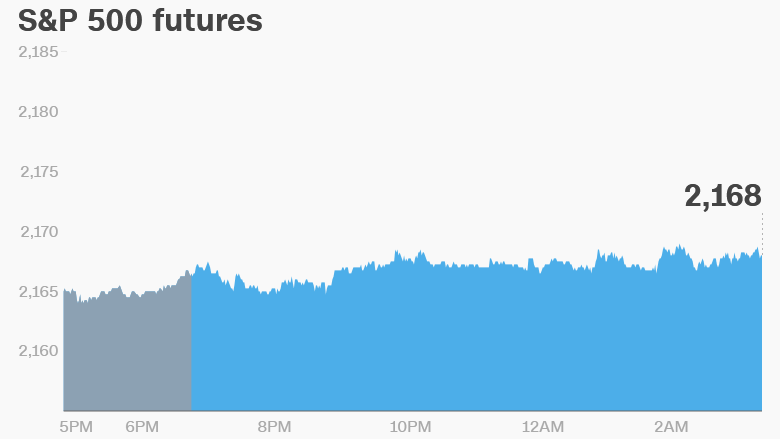 Taking stock: U.S. stock futures are pushing higher and the Nasdaq is doing particularly well. There's no doubt that Apple's premarket surge is fueling the Nasdaq. European markets are mostly rising in early trading, though the gains are relatively modest. Asian markets closed with mixed results. Chinese markets posted the biggest losses while the Nikkei index in Tokyo jumped by 1.7%. 5. Tuesday market recap: U.S. stock market performance was uninspiring on Tuesday. The Dow Jones industrial average shed 0.1%, while the S&P 500 stayed flat and the Nasdaq inched up 0.2%.